Fordham University is a private institution that was founded in 1841. It has a total undergraduate enrollment of 9,258. The university’s setting is urban and the campus size is 93 acres. 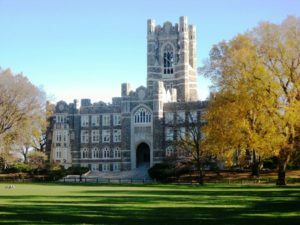 Fordham University’s ranking in the 2018 edition of Best Colleges is National Universities, 61. The Gabelli School of Business is the undergraduate and graduate business schools of Fordham University. The Center for Humanistic Management at the Gabelli School of Business is a research center with active outreach to practice and policy, and a commitment to developing novel pedagogical approaches with a focus on social innovation. The center is part of the Humanistic Management Network, an international, interdisciplinary, independent collective that promotes the development of an economic system with respect for human dignity and well-being.